Bite-sized morsels heading into the weekend. Blogging's still sparse while I work hard on my day job (looks like I might get an important new client!) and thumbnailing Mystery Project X. I'm into the fun pages of the latter: the exciting conclusion when all secrets are revealed amid wall-to-wall pulse-pounding action. Yeah, let's go with that. I still have a ton of work to do before my sketches become a proposal, then who knows how many months of drawing afterward to turn it into a near-200-page graphic novel. It's at this point that I always regain huge respect for anyone attempting a big creative project like this, even if it's an enormous steaming heap. After all, nobody sets out to make an enormous steaming heap, and it takes just as much time and energy. For all I know, that's what I'm doing. I worry about that. My friend Jim O'Kane is down in Florida right now, waiting to watch the penultimate Space Shuttle launch. At this writing, the weather looks good. Jim actually invited me along and I wish I could've taken him up on it, but North America's a big continent that I'm on the other side of and shuttles aren't famous for launching on schedule. Endeavour looks good to go today, though. Godspeed, Jim. BTW, Jim took a great photo yesterday that I'll post to my Whatever Happened to the World of Tomorrow Facebook Fan Page when I get a minute. If you haven't seen my album of "In the Wild" photos showing my book in various settings--including tombstones, rocket nozzles and Disneyland (isn't that a Lesley Gore song?) --you might enjoy that. Make my WHTTWOT page one of your "Favorites" while you're there, but only if you really feel that way deep in your heart. I don't care much about the Royal Wedding but Will and Kate seem like swell kids and I wish them well. I do appreciate the sense of tradition and century-spanning continuity that the wedding evokes. We don't have much of that in the New World and especially in California, where the oldest structures are missions from the 1770s. In Britain, they'd call that "the new stuff we're still breaking in." One aspect of the wedding coverage I've enjoyed is that, after making my first visit to London last year, I have an internal map of the geography: "Oh, I've been there!" 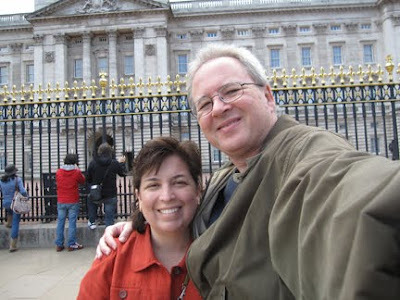 All these places--Buckingham Palace, St. James Park, Westminster Abbey, Parliament--are like a 20-minute walk apart. That makes the grand pageantry a bit homier. Karen and I showed up for the wedding 10 months early. I didn't mean to make this "Britain Day," but cartoonist Dan Collins posted the video below that I decided to repost for no other reason than it made me happy. After years of mostly seeing the Beatles in scratchy black and white, it sometimes startles me that film like this (from the movie "Help") exists--essentially a music video a couple of decades before MTV was invented. But it wasn't really that long ago, was it? They (we) were so young and they, at least, were charming. I was eating paste. Have a terrific weekend, everyone. It looks like spring around here. If you happen to look up at the stars tonight, take a second to marvel over the fact that we've got people up there. Friday Mid-Morning UPDATE: Oh no! It looks like the Shuttle launch has been scrubbed for at least two days. I hope Jim can stick it out! To paraphrase Heinlein, The Cape is a harsh mistress. Despite a cloudy, windy morning, the skies cleared and the breezes vanished in the afternoon. Of course, this was the perfect moment for one of the Shuttle's APU heaters to fail. Still, it's always a great space geek-meet, standing shoulder to shoulder with folks who know the number of latches on the Shuttle cargo bay doors, and can describe the pre-launch loading sequences for the propellants. Right now, I'm in a quandary: I'm traveling with my high school buddy, Peter, and he has to be back in Virginia on Sunday. If I drive all day tomorrow, I can swap out his car for my truck and then drive all the way back to the Cape for another go at it. I'm afraid it's a bit too much for even my sensibilities, and of course there is no guarantee that the Shuttle will be able to launch Monday. I've been up since 1:00am, so I think I'm going to have a nice coma for the rest of the afternoon. Thanks for your blog post, Brian!